История: Uniforms in DPM (Disruptive Pattern Material) has been in use since 1969. 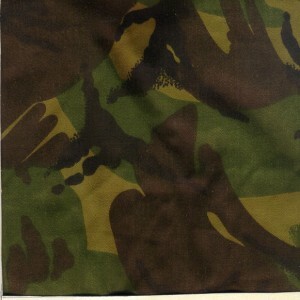 The first uniforms were called "Pattern 1960" as they were based on the plain green 1960 uniform. Pattern 1968 began being introduced in the start of the seventies. It was later superseded by the Pattern 1984. This pattern proved unsatisfactory and was then replaced by the Pattern 94. The jacket differes from previous pattern in that it has very large buttons, the DPM camouflage pattern is very "mustard" in colour and very different from previous patterns in colour (it looks a bit like the Dutch pattern). There is two pockets closed with zips behind the breast pockets on the jacket. This pattern was later superseded by the Soldier 95 pattern which is made in rip stop material. Использование: In use by the British army. Расцветка: The DPM consits of 4 colours: sand, green, brown and black.